Today I found out Charles Osborne (1894-1991) had the hiccups non-stop for approximately 68 years, from 1922 to June 5th, 1990. According to the Guinness Book of World Records, this is the longest bout of the hiccups ever recorded. Eventually, he learned to suppress most of the noise of a typical hiccup by breathing methodically between hiccups, which was a technique taught to him by doctors at the Mayo Clinic. The fact that he kept his sanity through this is amazing enough, but apparently he lead a pretty normal life. He married twice over his long life (lived to the ripe age of 97) with the second wife marrying him despite the hiccups (he did not have the hiccups when he got married the first time). He also fathered eight children. Later in life though, he was forced to start grinding any food he ate in a blender due to the fact that it was hard for food to reach his stomach between hiccups. Miraculously, about a year before Osborne died, his hiccups stopped. The total number of years of his life he had the hiccups was about 68 years; the total without was about 29 years divided between the first 28 years of his life and the last year. Another dramatic case of the hiccups occurred in 2006 with a man named Christopher Sands who lived in Lincolnshire, England. Sands’ hiccups lasted around 3 years and robbed him of his career as a musician and vocalist. His hiccups were so bad at times that he would be unable to breath properly and would occasionally pass out from it. He also had significant difficulty in sleeping. Sands eventually received media attention in 2009 and doctors in the United States investigated and found he had a tumor in his brain stem that was causing the hiccups. After removing it, the hiccups went away. In 2007, Jennifer Mee of Florida hiccuped over 50 times per minute for around 35 days straight before the hiccups went away. This same girl was later arrested for murder in 2010 after taking part in a robbery. The word “hiccup” itself is an onomatopoeia that first appeared in the 18th century. Although, as early as the 16th century it was being called a “hickop” or “hicket”. The technical name for a hiccup is a synchronous diaphragmatic flutter (SDF) or singultus. Singultus derives from the Latin “singult” which means “the act of catching one’s breath while sobbing”. I’ve FELT like I had hiccups for that long. The United States had nothing to do with my recovery. In fact I received media attention and went to Japan they found the tumour and I had it removed back in Sheffield in the UK. I have written a summery of my story here if you are genuinely interested. @Chsitopher Sands: Awesome. My sources for the “U.S.” bit were from news agencies. Never trust the news! Charles Osborne could have been cured. A doctor could have cut the nerves that regulate breathing, and then maintained breathing, with a mechanical respirator. I am also suffering from the same hiccups problem from last two years. I got several courses of drugs from several doctors but couldn’t get it cured. I am suffering from it as these hiccups are too severe. May I know what kind of health checkups I should get to know the reason behind my hiccups? Did your hiccups get cured? Yea, great solution, then he’d have been on machines the rest of his life. Avoid living through a machine as long as you can. My response to random is this. If you read the article “Still Hiccuping After 63 Years” “Newsweek” February 18, 1985, you will find that Charles Osborne’s condition was life threatening It is clearly ethically acceptable to put someone on a respirator, to save their life. Ever heard of quality of life? I can’t truly know what he was living through, but I think smokers would hope you don’t have to carry a respirator or oxygen everywhere. I mean would you like the paranoia of your life being in the care of a machine, being tethered to this lifeline that was only as good as 80’s medical technology? The machine was perhaps even bulky and heavy. Consider the sharp drop in cell phone size since the 80’s. His age would have made the surgery life threatening too. So have a better last few years of life, or risk dying prematurely? His call of course. The “Newsweek” article “Still Hiccuping After 63 Years” makes clear that Charles Osborne’s quality of life was worse than that of someone on a respirator. Reader’s Digest published a story of a fellow who suffered through several years of hiccups. The fellow gave up trying to discover what caused the hiccups, and just lived with them. One day, during an non-hiccup-related appointment, his doctor changed his heart medication, and, lo and behold, his hiccups ceased! They figured that they must have been a reaction to his former heart medication. When I was on painkillers for a broken bone, I was prone to the hiccups a LOT. I checked with the doctor, and they told me that this was a fairly common reaction to opiates. Not surprising it could be a medication-related issue. I’ve had the hiccups now since Oct. 2013. Its been 1 year and 4 months and counting. Been to several doctors, tried all the normal remedies. Any ideas, please let me know. Hiccups really steal quality of life. My husband has had them for 1year 8mths. The first year was horrible as the hiccups were accompanied by constant vomiting which led to a lot of medical complications. Thank God they operated in Dec last year and the vomiting stopped and he started sleeping. We have been to several doctors and specialists who have plainly indicated there is nothing else they can do as they have done all investigations possible and they all say he is OK. He is not responding to any of the medications. Anyone with any suggestions please?????????? He is not able to do anything anymore and basically spends his days in bed and wishing to sleep so he gets relief. My husband has had them for about a year. He has been to a GP, two neurologists and three gastro doctors (he has bad GERD) and none of them have a cure. The medications didnt work on him either. They just keep doing tests and send him to someone else. He can sleep through it when he takes Xanax but has a hard time waking up in the morning. I sleep in the guest room alot because it keeps me up. Not happy! I dont have any suggestions but you are not alone…we are going to another Gastro doctor tomorrow and have an appointment with the Cleveland Clinic in November…I will post any info I I get any,,,good luck to you! The person in this photograph is not the man you are mentioning. 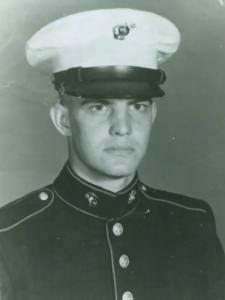 This is PFC Charles Osborne, United States Marine, killed in action in Vietnam in 1966 and my uncle. Please get that fact straight. How did you locate this article? I thought this man was Black? i could have sworn I saw a video of him and he had a hitch in his speech. I have had the hiccups for almost 8 years (Aug. 26th) they started when I wasbin High school and never stopped. I had a fundoplication surgery which lessened them but they did not go away. I stopped going to the doctor because they told me it was all in my head. I can go about 30 minutes in between hiccups sometimes but they are all extremely painful. It sounds like you need to find another doctor. Sorry to hear your doctor feels that way and you’re suffering while dealing with that lack of support. It looking and searching for answers. You can read my comments above. No changes and no answers. Still hiccuping since 2013 and still not eating since 2015.